According to the latest data from Hotels.com, there has been a 3% increase in global accommodation prices, reaching levels not seen since 2004. There’s no sign of a slowdown for the global travel industry, according to the latest Hotel Price Index (HPI) from Hotels.com. 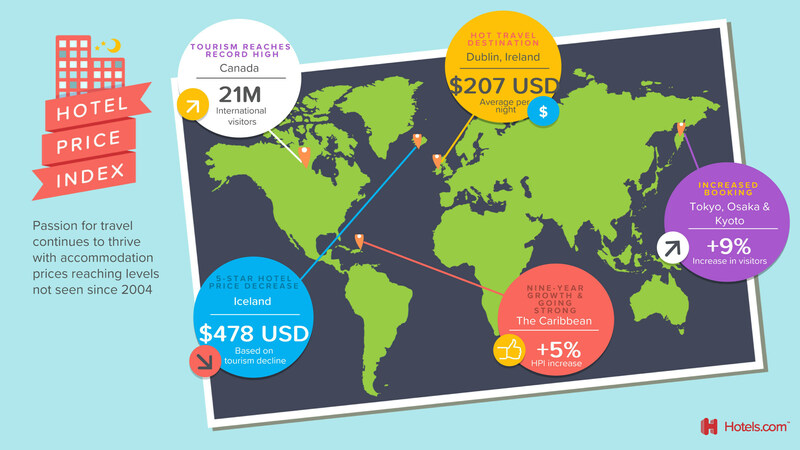 The prices travellers paid for overnight accommodation rose 3% globally in 2018, with every regional index, except the Pacific, receiving a boost. The growth in travel comes despite uncertainty such as Brexit; the wildfires in California; drought in South Africa and earthquakes in Japan. Travellers also showed resilience and renewed confidence in destinations touched by unrest like Paris, Egypt and Turkey, as well as regions experiencing currency fluctuations like South America, and areas in North America affected by natural disaster. Despite the impact of the California wildfires and two major hurricanes hitting the Carolinas and Florida, the US hotel industry saw growth among domestic travellers with average prices rising in 27 of the top 50 destinations. In Canada, Toronto topped the most popular Canadian destinations for international travellers, with Vancouver coming in second. Montreal, Niagara Falls and Calgary rounded out the top five most popular respectively. Among the destinations that rose to the top for American and Canadian travellers in 2018 were Ireland, Japan and Turkey. Flexible visa requirements in some markets and a visit from Pope Francis in August helped Ireland bring in more than 10 million travellers in 2018, a record high. American travellers paid 10% more for accommodations in Dublin, an average of USD 207 per night. In Japan, Tokyo, Osaka and Kyoto, visitor numbers grew by almost 9% for a record high of almost 32 million. Osaka and Kyoto both rose more than 10 spots on the list of the US and Canada’s most popular international destinations. Turkey’s tourism is booming despite a financially difficult year in 2018, with Istanbul jumping more than 10 spots in the top 50 most popular destinations for both the US and Canada. International visitors went up by 22% in Turkey and Istanbul recorded the highest rise in the price paid by American travellers in 2018.